I find this particularly poignant from Nietzsche in the post-9/11 American consciousness. I feel like under the “War on Terror” umbrella, we have embraced, in large part, this idea that to stop monsters (terrorists), we too have to become monsters. In other words, there are documented cases of the U.S. government torturing, using rendition, bombing civilians, double-tapping in drone attacks and have abated much of our own civil liberties basis on the domestic front with wide scale spying, the Patriot Act, the war on whistleblowers and journalists, and much more. This is anecdotal, but I can’t tell you how many times I’ve seen people try to justify the torture of a terrorist. And they often fallback on the ticking time bomb scenario, but unfortunately, life isn’t a replication of 24 and our government doesn’t have a Jack Bauer; life doesn’t actually work under a ticking time bomb scenario and neither does torture. “Sometimes you just have to get on their level.” No, no you don’t. 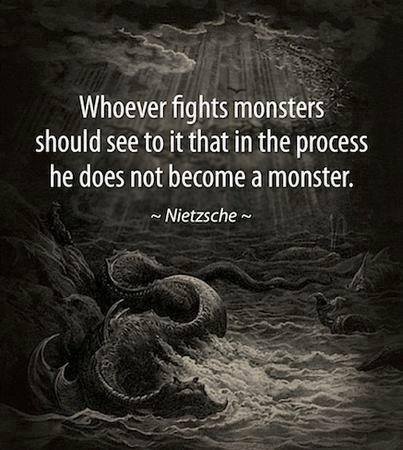 The whole point is that we’re supposed to be the arbiters of justice, liberty and more or less “doing the right thing.” That’s not arguing in favor of blind, absolutist idealism, but what does it matter if you vanquish the monster when you yourself have become a monster? What was it all for then? I’d say it’s all for naught. That’s a tough pill to swallow, that maybe, just maybe, the twelve years since 9/11 hasn’t really achieved much and instead, have been a bit of a regression in our values. Sure, we got Osama, certainly dealt a heavy blow to his terrorist network on a global scale, but was it worth two big wars and countless dead? Was it worth making more enemies? Was it worth the accumulation of executive power that ensured we’re not really living in a functioning democracy, as former President Jimmy Carter said? I think since 9/11 Americans have been gazing into the abyss in a daze, unable to fixate our eyes on anything else and it has led to some truly tragic, unfortunate circumstances and events in that time. We need to look away, regain the reins on our government and reexamine the type of society we want to be. Do we want to be the monsters? First, I would say the “we’re” is not necessarily supposed to be an American-centric idea, but since we’re the ones perpetrating these abuses in large part, I bring it back to that focus. I mostly envision the “we’re” as the human race in total because I don’t really get into the geographical boundaries; we’re humans, national identity has some cultural significance to people, I get that, but being human comes first. As for what I base the premise that we, as in humans, should be the arbiters of “justice, liberty and more or less ‘doing the right thing. '” Hedonism bothers me and that may sound ironic coming from a libertarian, but I reject the idea of “looking out for number one.” I believe that a truth exists beyond humans — that is, the capital “t” Truth. And encapsulated within that Truth is morality and how we ought to live our lives as rational human beings. Generally, I think as rational, moral human beings, we ought to live our lives by more or less ‘doing the right thing.’ Or trying to. At the very least, we need to figure out this “Truth” and how we “ought to live.” So, in short, I think there’s a way humans ought to live and that goes beyond hedonism, national identity, and so forth. I should also point out, as a matter of philosophy, I believe that “Truth” exists beyond the reach of God, as well, if there so exists a God. Because if God can manipulate that “Truth” or more specifically, the laws of morality (and presumably he can, if he is all-powerful/all-knowing), then we get back to the problem of subjectivity, which really bothers me on a philosophical level. As for how do you maintain that sense of “doing the right thing?” I’m not really sure to be honest. I’ll digest that one for a bit. I hope I achieved an answer to your question. I tend to be verbose. Thanks for commenting and getting my brain moving tonight! Thank you, Tom, I appreciate that!